Here in Ome I'm crazy busy this month - the exhibition is drawing closer day by day, and it's going to be 'touch and go' whether or not I will be able to get the next print finished in time to display it there. Why is it taking so long? The main story in this issue will give you a pretty good idea! We'll also have a bit of an update on my A Story a Week project, and of course, another column in the Sadako's Corner series. How do you like this year's New Year print? As you can see, it's not something original, but is taken from an illustrated book produced by Katsushika Hokusai. It's a type of landscape he was very good at, and I'm sure he could draw these things as fast as his brush could move. Having spent most of the past year working on prints of my own design, it was a very pleasant experience for me to carve this reproduction. There were no worries at all about 'is this any good?' ... just peaceful time spent carving and printing. 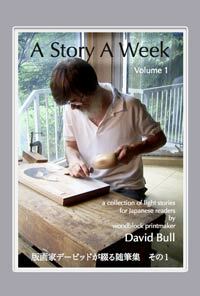 I am writing the stories for this issue of the Hyakunin Issho newsletter during the final week of December, snatching some time away from my carving bench to do so. The job in progress on the bench this week is a group of blocks to do the colour printing on the upcoming print in the 'My Solitudes' series. The design isn't ready to show you yet, but part of the image involves a rock in the river with a stream of water sliding past it. I want the rock to look fairly natural, so these colour blocks will all have areas of carved wood that represent texture and shading on the rock. Look at all those little dots! And this is just part of just one of the blocks! 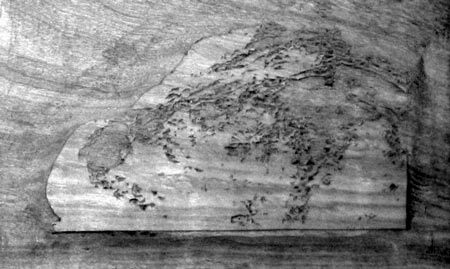 And of course, the way woodblock printmaking works is that those dots represent the wood that is left behind; I have to carve away all the wood around them in order for the patterns to print properly. As you may expect, this is taking me quite some time. All this week, while most people all over this country are running around this way and that getting their year-end preparations done, I am sitting here in my workshop for hour after hour after hour, looking down through my magnifying glass and cutting thousands of tiny dots. Does this make sense? Isn't there a better way to do this? For many years now, people in various occupations in society have had to face the threat of having their jobs taken over by machines. Actually, this goes back a couple of hundred years to the beginning of the industrial revolution, but it is only since computers became very common that basically everybody has had to be concerned about this sort of thing. In a great many cases, when the question arises, "Should we do this by hand, or by machine? ", the answer is obvious. Our modern telephone system couldn't possibly work if we still had rooms full of young women plugging all the connections manually, and we couldn't build our modern cities without giant machines to dig and carry for us. There is absolutely no question that the efficiencies of mechanization are what make our contemporary society possible. For companies (and individuals) in this modern world, when the opportunity arises to use machines or computers to do a job that was previously done by hand, the answer to the question usually comes down to an analysis of a couple of points; is it cheaper to do it by hand or by machine, and is the final product better when made by machine. Because machines and computers are becoming so advanced these days, most products we see around us are now far more well-made than they used to be, and far more inexpensive too. A modern automobile, just for one example, is an incredibly efficient machine. Don't you remember how frequently cars used to break down, and how much maintenance they always needed? 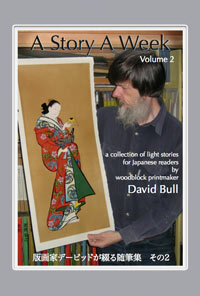 And yes, even in this marginal field of woodblock printmaking, mechanical methods are creeping closer and ever closer. Many of the famous prints made by the Yoshida family (Hiroshi and Toshi) are printed from 'blocks' that are actually metal, produced quickly and easily from their drawings without being carved. 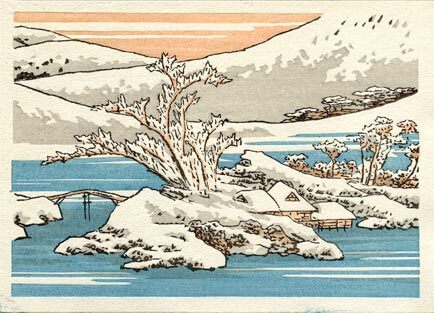 And a couple of years ago, I saw small inexpensive woodblocks for sale in a stationery store for printing new year card designs, which had been carved automatically by laser. So, putting all these points together ... that the technology exists to produce these dots easily and cheaply - that the end product would be no worse, and perhaps improved - and that I would be able to 'save time' for doing other tasks ... what would you recommend? 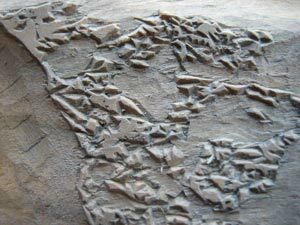 Should I switch to an automated system, or continue carving such things by hand? Now of course, I'm not really asking for your opinion on this, so you have no need to answer. 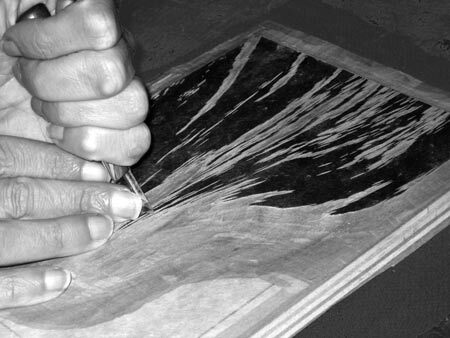 I made my decision on this many years ago, in the earliest days of my woodblock printmaking adventure, when I was working on Tenji Tenno, the first of the 100 prints of the Hyakunin Isshu that I made. It was 1989; I was still relatively inexperienced at woodblock printmaking, and - of course - I had no idea that I would still be doing the same thing nearly two decades later. As I worked on that print, I had so many ideas about how to 'improve' the process! "If I put a screw adjustment device at that corner of my printing bench, I would be able to make the 'kento' adjustments very easily, with just a tiny turn of a dial!" "If I build an overhanging arm on the bench with a clamp on it to hold the knife, I could cut the straight lines on this print very quickly and accurately!" "If I design some kind of holder for the inner disc of the baren, I would be able to tie the outer cover in place much more easily!" Well, did I build any of those tools to help me with the work? No. And the reason I didn't, is that I asked - and answered - a much more important question first, the question "Why am I making woodblock prints?" And the answer was not the same as the craftsmen in the old days would have answered. They would have replied "Why make woodblock prints? ... It's our job! People will buy them, and will enjoy them. That's our function in this society." But my answer must be different, "The purpose of making woodblock prints is ... to enjoy the process of making woodblock prints ... of course! People may also buy them, and hopefully will enjoy them." For the men of the old days, working as quickly and efficiently as possible was vital; if tools for better carving had become available, there is no question that they would have been used. And of course, this is actually what happened; the invention and development of the printing press completely took over the process. But for me efficiency is not a consideration. As I keep telling people (and they nearly always think I'm joking), "If you like doing something, isn't it better if it takes a long time?" And honestly speaking, I rather suspect that more than a few of those people who are out there this week running around to get their year-end chores done in time wouldn't mind changing places with me, don't you think? 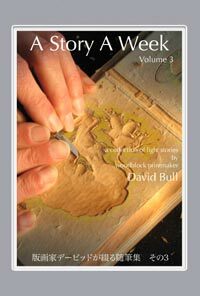 It seems a bit hard to believe, because it seems as though I started it only just the other month, but my 'A Story A Week' series has now completed its second full year! 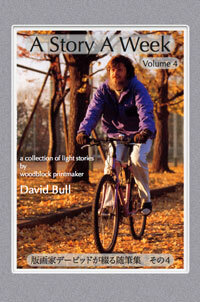 Every Sunday morning a new story is available on the website, and twice every year, a printed volume containing all the stories from the previous six months is published - four of them now! Is it a difficult job getting a new story written, edited and recorded every week? Not at all; it's a lot of fun. My only regret is that I didn't start this project many years ago; what a heavy shelf of books I would now have! The original intent was to create a collection of light stories for Japanese readers, but I learned early on that native English readers found them interesting as well, so there is now no specific 'target' audience. Themes for the stories wander all over the map, with episodes from my daily life, remembered events from my musician days, and even conversations with Boots the Cat! There is one other item to mention about book publishing; you may remember that I had a colouring book of my Hyakunin Isshu prints published last year. I have to report that not too long after issuing my book, that publishing company went bankrupt, and the book is unfortunately no longer available. So you see ... you should act quickly, and get all of my books as soon as you can! Although it doesn't happen much recently, it used to be fairly common a couple of decades ago to engage in casual conversations with people on the train (usually middle-aged or older ladies). We would chat about such things as the weather, or which station to make a transfer, and passed the time pleasantly. To make smooth conversations with strangers - which can have a slight degree of enjoyable tension - we need to be sensitive about many aspects. We also have chances to overhear other people speaking, and it is fun to listen to how such conversations go. The other day - just at the end of the year - I was standing in a long line at a nearby supermarket, when the lady behind me started a conversation with the man behind her. It was obvious that they were strangers, and as I had nothing to do other than stand there with my basket waiting for my turn at the checkout, I ended up hearing their conversation. Woman: "I see you picked up some of that bargain mayonnaise too." Man: "The clerk said that they were all out, but I found a bunch of them in the next aisle." Woman: "It's too cheap to resist, isn't it! But I still have some at home!" Man: "Well, as our money earns nothing in the bank, this is the only way to get ahead, isn't it! Bit by bit, it all adds up ..."
Woman: "Did you bring the discount card for today?" Woman: "My husband doesn't help me with housework at all ..."
Man: "That's too bad. I do cooking, vacuuming .."
Woman: "Oh, I envy your wife!" So watch out when you converse in public places because a mean old woman may be straining her ears! But now that I think about it, the woman behind me must have had good sense because she chose not to talk to me! By the way, many local supermarkets offer 'point cards' these days; every time you shop the cash register adds points in a certain ratio to your payment. I get 1,000 yen in coupons every few months so even I - such a lazy woman - use these cards, but Dave continues to resist. He just doesn't like their attempts to 'keep you coming back'. There are many different people in the world!